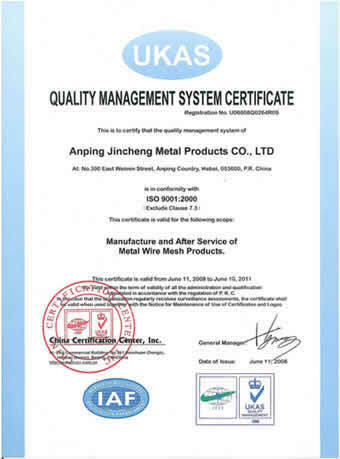 About Us|Anping County Jincheng Metal Products Co ., Ltd.
Anping County Jincheng Metal Products Co., Ltd. is one of the biggest production and sales enterprises in Anping County, Hebei Province, which is famous as the "Wire Mesh Production Base of China". 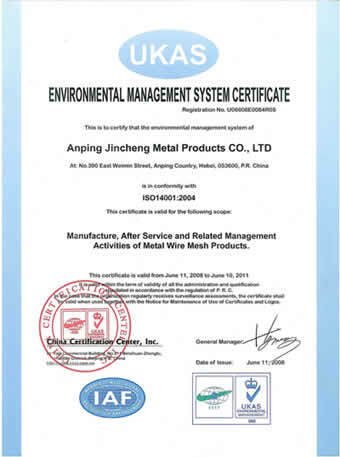 It has the license to export directly by itself, and the products have passed the ISO9001 Quality Management System Certification and the ISO14000 Environmental Management System Certification. 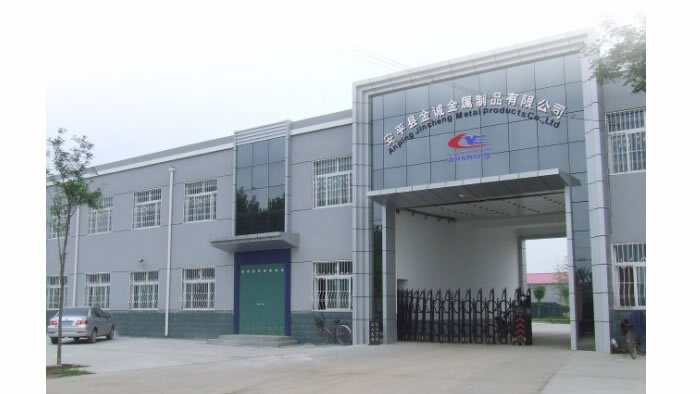 Our company was built in 1996, covering an area of 12,000 square meters. It's a private enterprise with a registered capital of 50 million yuan. After years of continuous development, we now have become an export-oriented enterprise with fixed asset of 120 million yuan, 110 employees, 35 technical personnels and more than 200 sets production and testing equipment. Our main products fall into five major categories, more than 100 varieties and more than 2,000 specifications. Our products are mainly used in petroleum, chemicals, construction, textile, medicine, aviation, aerospace and other fields. With the production capacity of 1.8 million square-metres, wire drawing capacity of 4,000 tons per year, more than 95% of our products have been exported. We now have established a solid trade relationship with United States, Germany, Japan, South Korea and other worldwide countries and regions. This is an era full of opportunities, full of challenges, full of aspirations. We hope to cooperate and develop with the whole world's friends. Welcome to contact us.